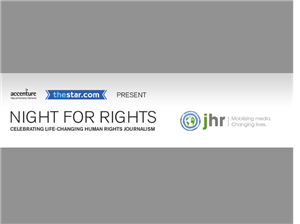 JHR Night for Rights 2015 Oct 1, 2015 Welcome to the liveblog for Journalists for Human Rights' annual Night for Rights, being held this evening at the Arcadian Court in Toronto. The evening will feature vibrant updates from JHR-trained journalists, the inaugural Lifetime Achievement Award for Human Rights Reporting, and a dynamic live auction hosted by the one-and-only Auctionista. It will be an unforgetable evening of celebrating rights-based media reporting, with proceeds going to support JHR's work around the world. JHR Night for Rights Live Sep 26, 2013 - 7:43 PM EDT Get ready to celebrate the transformative power of human rights journalism at Night for Rights 2013. 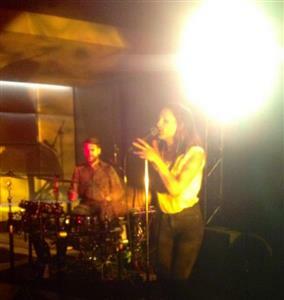 When media puts the spotlight on human rights, positive change happens. When human rights are protected, people’s lives get better. Journalists for Human Rights empowers journalists to cover human rights stories objectively and effectively. News from DR Congo: Local Perspectives Feb 27, 2013 Journalists for Human Rights presents Live from DRCongo: Local Perspectives From The Conflict Zone, a live feed featuring the work of Congolese journalists on the ground in the war-torn East. The current political and humanitarian crisis in the Eastern DR Congo has radically restricted media in the region, particularly in the major city of Goma. This feed will feature exclusive reporting from local journalists in Goma and Bukavu, focusing on human rights and governance issues.